The Southeastern Amateur was created in 1922 by Fred Haskins, the Head Golf Professional at the Columbus Country Club, and was known as the Columbus Country Club Invitational. W.H. Dismuke Sr. won that inaugural event. 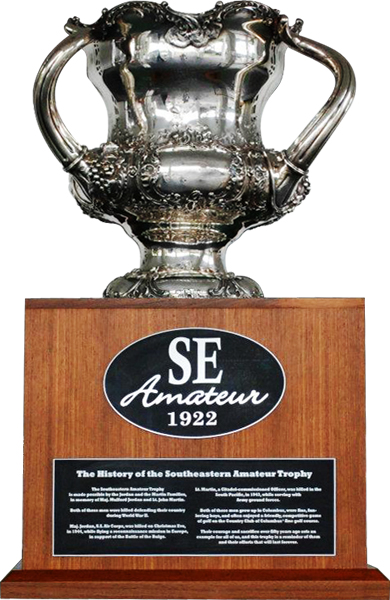 The tournament was later renamed in 1938 to the Southeastern Amateur. Mr. Tommy Barnes was the first to have his name inscribed on the newly named, Jordan-Martin Trophy. The tournament has been held in both Match-Play and Stroke-play formats, and many records have been set along the way. Among the winners since that event are Doug Sanders, Tommy Aaron, Danny Edwards, Curtis Strange, Columbus native Kenny Knox, and 5 time champion Allen Doyle. Included on the runner-up list are Mason Randolph, Gardner Dickinson, Bert Greene, Steve Melnyk, Gary Koch, Ben Crenshaw, Fuzzy Zoeller, Andy Bean, Willy Wood, and Paul Azinger. Aaron, Crenshaw, and Zoeller wear the green jacket of a Masters Champion, and Mr. Doyle launched into his senior tour career, shortly after winning his fifth Southeastern, where he has won the Senior U.S. Open twice. The first tournament in 1922 was held before the course was actually complete and was only a 13-hole course. Once the Donald Ross design was put into place between 1923 and 1925 making the course a full 18-holes, the tournament flourished. By the 50's, it had become the premier tournament for amateurs in the southeastern United States. As travel became more convenient, the tournament has transformed into what it is today, a top level amateur tournament that attracts the top players from around the world. The course itself had been through many changes through the history of the tournament. In 2003, the course was put through an extensive renovation after Cecil Calhoun obtained the original Donald Ross designs. The course was made as close to those designs as possible during that rennovation, including the famous postage stamp green on #4, and of course the ever present "shaved" collection areas that are the signature of all Donald Ross designs. The Southeastern Amateur Trophy is made possible by the Jordan and the Martin Families, In memory of Maj. Mulford Jordan and Lt. John Martin. Both of the brave men were killed defending their country, during World War II. Maj. Jordan, U.S. Air Corps, was killed on Christmas Eve, in 1944, while flying a reconnaisance mission in Europe, in support of the Battle of the Bulge. Lt. Martin, a Citadel-commissioned Officer, was killed in the South Pacific, in 1943, while serving with Army ground forces. Both of these men grew up in Columbus and often enjoyed a friendly, competitive game of golf on the Country Club of Columbus' fine golf course. Their courage and sacrifice some fifty years ago sets an example for all of us, and this trophy is a reminder of them and their efforts that will last forever. This trophy is officially named in their honor as the Jordan-Martin Trophy.